Wow. I havn't such a bug, even if I travel on all Miranda. Maybe the download had failed. How does this bug comes ? This bump map covers only one hemisphere of Miranda. The other side remains uncharted by now. I did all that and it still gets a little "crack". It's actually not a big deal for me, I think the bump maps you've made are excellent! Hmm, I tried reinstalling the files, clearing the cache, and copy-pasting the surface tag you just posted instead of adding stuff manually to solarsys.sc and am still getting those deep furrows instead of flat land on the unexplored side. However, since it can't be seen until quite close by anyway and at that point the map's low resolution is very apparent, it's not much of a problem. Enceladus bump map is out. Dione, Tethys, and Rhea links don't work. Any chance of getting bumpmaps of Ariel, Umbriel, Titania, Oberon, or Triton? There is no available data on the internet about these moons. So the only vay to create bump maps for these satellites is to create it myself. I'll work on it when time permits. 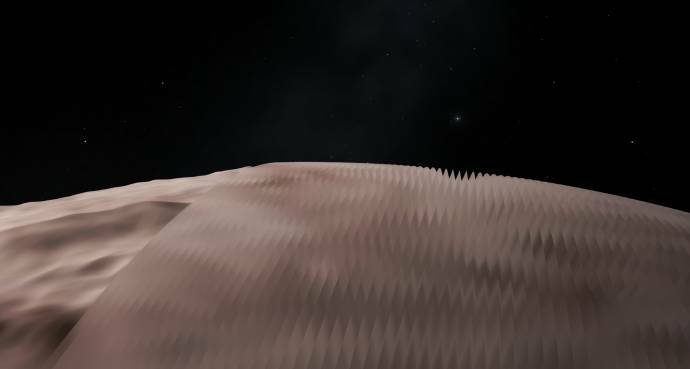 Perhaps you could make a better "model" of Mimas? I regularly check it (and last month, I was very glad to find Iapetus, Tethys & etc...), but all bumps maps of Mimas I have found were worse than SE's one. Sometimes, I find a new bump map, but, then, I noticed that it is just a color map that have been converted to greyscale . This seemed to be a surface map converted to grayscale. In a bump map, a crater is like a black spot with a white border, and, it is computed with integration of data from the color map and the photos.